It’s that time of year again and I’m looking for great hands-on, interactive, meaningful and relevant gifts for each of my 5 young grandchildren…though they are not very young now. They’re 8, 10, 11, 12, and 13 years old! But if they were 1, 2, 3, 4, or 5 years old, I would be looking at the following toys and products from Discount School Supply. A few of my favorite things include the 3 B’s of Childhood—Blocks, Balls, and Books! My granddaughters still have this and they are now 8 and 10 years old. I think my daughter is going to save this toy for their children. It’s a classic! I also recommended this barn to a colleague of mine who has her own nature school and she just loved, loved, loved it! Don’t forget, you can also order the Large Farm Animals. Excellerations® Building Brilliance Magnetic Shapes These shapes help nurture creativity, imagination, fine motor skills, problem solving, math, scientific investigation, as well as cooperative play. This toy never goes out of style! You can’t help but pick up these cuties and give them a squeeze. Feel and listen for the squeak, crinkle, and rattle. They’re just the right size for little hands. I’ll be sure to put this out when we have our family gathering. It’s irresistible for little and big hands. It comes in other colors but I still love the original white. This is a different kind of bean bag, suitable for even the youngest child (ages 18 months +). It’s fuzzy on the outside and crinkly on the inside. They’re perfect stocking stuffers! Some adults even use them to clean the screen on their electronic devices! I am so happy to see that these are still available. Each of my grandchildren received these blocks from me and I’ve instructed their parents to never get rid of them! Blocks are an important toy for children of all ages. If you think these are too large for your space, check out these smaller Foam Wooden Blocks. This bag of balls is bountiful! 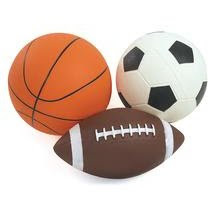 It includes the outstanding Oballs, Sensory Balls, and traditional Playground Balls. This item even comes with its own hand pump! There’s no excuse to not get these balls rolling and bouncing. Art is messy and kids are messy too. But these plastic mats keep the creations contained and make clean up a breeze. Give children some favorite paints, watercolors, paper, and painting tools and let the creativity begin! This is a favorite children’s book that encourages everyone to get moving. Stand up or sit down to act out the story using hand and body motions as you read. 1. Balls — Throw them, toss them, catch them, roll them, kick them, bounce them. Children of all ages love balls. They develop gross motor and fine motor skills, as well as hand-eye coordination. A Basketball Hoop, Soccer Goal, or Target Toss make for a value added gift that spans across ages! 2. 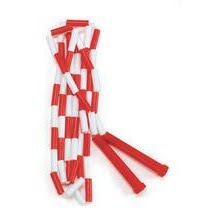 Jump Ropes — Simple and inexpensive, this piece of equipment can be taken anywhere. Jumping rope is a cardiovascular activity which also improves strength, balance, agility and coordination. Preschoolers, not ready to jump rope, can walk and balance on a straight or curved rope on the ground or jump over a stationary rope held a few inches off the ground. 3. Hoops — What goes around comes around! When using hoops, the goal is to keep the hoop moving on your hips as long as possible. The hoop can also be rotated around other parts of the body– arms, legs, neck– just for the fun of it. Young children can roll the hoop and run to catch it before it falls flat on the ground. 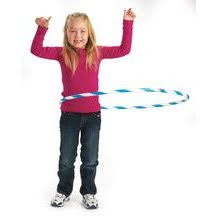 There are even smaller Activity Hoops that some children will feel more comfortable using. The Hula Hoop was inducted into the Toy Hall of Fame in 1999. While still being fun for children to play with, it has taken a turn in even offering health benefits for adult fitness. 4. Trikes & Wheeled Toys — Experts recommend about 1½ to 2 hours of physical activity for toddlers and preschoolers daily, especially outdoor activities like pedaling a tricycle and using push/pull/ride toys. 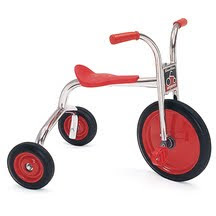 The tricycle is a great first set of wheels for children younger than 5. Inside or out, time spent wheeling around puts children in the “driver’s seat,” allowing them to explore the limits of their skills in a positive way. Watching a child’s excitement as he or she learns to ride their first trike is thrilling and fun! Plus, tricycles are such a memorable part of childhood. 5. 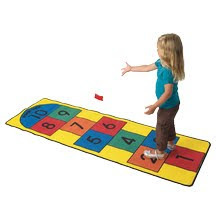 Hopscotch — Whether you make your own grid with some Sidewalk Chalk or purchase a Hopscotch Play Carpet, the game of hopscotch is a classic children’s game. Start by tossing the marker (typically a stone, coin or bean bag) into the first square. The player then hops through the course, skipping the square with the marker on it. Single squares must be hopped on one foot. Side by side squares are straddle jumped, with the left foot landing in the left square, and the right foot landing in the right square. The idea is to go through the entire course without losing your balance. After you get to the top, you turn and head back down the course picking up the stone or bean bag when you come to it. If you complete the course without falling, stepping on a line, or missing one of the boxes, you throw the marker to the next numbered box and repeat the process. If you don’t complete the course, you must wait your turn and then start in the box where you ended your previous turn. Hopscotch lets kids hop and jump their way to being more physically active while developing balance, coordination and flexibility. Why not give a gift that keeps on giving? Active gifts will give children endless hours of fun, keep them moving and fit and developing important motor skills.